These objects are set up by the RegisterPass<> template. Definition at line 30 of file PassInfo.h. Definition at line 32 of file PassInfo.h. Definition at line 47 of file PassInfo.h. This version is for use by analysis groups; it does not auto-register the pass. Definition at line 55 of file PassInfo.h. addInterfaceImplemented - This method is called when this pass is registered as a member of an analysis group with the RegisterAnalysisGroup template. Definition at line 107 of file PassInfo.h. Definition at line 96 of file PassInfo.h. Referenced by llvm::PMDataManager::add(), llvm::Pass::createPass(), and llvm::PMTopLevelManager::schedulePass(). getInterfacesImplemented - Return a list of all of the analysis group interfaces implemented by this pass. Definition at line 113 of file PassInfo.h. Referenced by llvm::PMTopLevelManager::addImmutablePass(), and llvm::PMDataManager::recordAvailableAnalysis(). getNormalCtor - Return a pointer to a function, that when called, creates an instance of the pass and returns it. This pointer may be null if there is no default constructor for the pass. Definition at line 88 of file PassInfo.h. Referenced by llvm::PassNameParser::ignorablePass(), and llvm::PassRegistry::registerAnalysisGroup(). getPassArgument - Return the command line option that may be passed to 'opt' that will cause this pass to be run. This will return null if there is no argument. Definition at line 67 of file PassInfo.h. 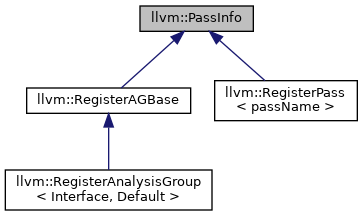 Referenced by llvm::PassNameParser::ignorablePass(), llvm::PassArgFilter< Args >::operator()(), llvm::PassNameParser::passRegistered(), llvm::PassRegistry::registerPass(), and llvm::PMTopLevelManager::schedulePass(). Definition at line 62 of file PassInfo.h. Referenced by llvm::PMDataManager::dumpUsedSet(), llvm::Pass::getPassName(), and llvm::PassNameParser::passRegistered(). Definition at line 71 of file PassInfo.h. Referenced by llvm::TargetPassConfig::addMachinePasses(), llvm::AnalysisUsage::addPreserved(), getPassIDFromName(), llvm::PassNameParser::PassNameParser(), and llvm::PassRegistry::registerPass(). Definition at line 79 of file PassInfo.h. Referenced by llvm::FPPassManager::doFinalization(), and llvm::PMTopLevelManager::schedulePass(). Definition at line 78 of file PassInfo.h. Referenced by createPass(), and llvm::PassRegistry::registerAnalysisGroup(). Definition at line 83 of file PassInfo.h. Definition at line 74 of file PassInfo.h. Definition at line 91 of file PassInfo.h.